Picture by Allan McKenzie/YWNG - 11/04/2015 - Rugby League - First Utility Super League - Castleford Tigers v Hull Kingston Rovers - The Mend A Hose Jungle, Castleford, England - Castleford's Michael Shenton. Skipper Michael Shenton may have won the sponsors man of the match and passed a career milestone in the 36-30 victory over Hull FC, but he has praised his team-mates for their contribution to getting Castleford Tigers off to a winning start in their Super Eights campaign. Although England international Shenton crossed for four tries in a match for the first time and in the process took his career try tally past the 150 mark on a memorable night, he was quick to praise his left edge attacking partner Justin Carney in particular. He said: “The boys really dug in, our halves put the ball where it needed to be and then Justin Carney’s chase and just his energy throughout, for me, got us the win. “He was really good. He made some really big calls for us. “Obviously it’s a team game and our forwards really got to grips in that second half and smashed theirs to be honest. “Defensively they were putting people like Mickey Paea on their backsides which is where we want to be and where you should start the game really not waiting so long. After avenging earlier losses to Hull, Shenton and his team-mates are now focusing on another revenge mission when they take on a Warrington side that only two games ago beat them 44-6 at the Mend-A-Hose jungle. 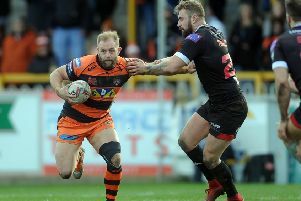 The Cas captain believes that while it was great to beat Hull the Tigers will have to step up on their display last Friday and learn from some of the errors they made. He said: “We owe Warrington one. We owed Hull one - they’ve both embarrassed us this year - and did that so it’d be a great time to make amends for our loss last time around, too. “It was pretty pleasing to get the win against Hull but there were mistakes in there and we have to focus on improving that against Warrington as we can’t afford to continue doing that in these Super Eights games. “There was just little things that frustrated us. “When we got a grip on the game, for example, and then came up with errors at their end, or gave cheap penalties to let them out and back into the contest. “There was a point in that match where if we just knocked our sets off and went for a drop goal, with a seven-point cushion, it would have killed Hull’s spirit. “Instead we get a decent lead and then let them get back into which is pretty disappointing. We have to learn from it. “We don’t want to be at our best just yet but as long as we learn from Friday, that’s the main thing. Castleford will have to start sharper this week than they did against Hull when they were 12 points behind before they had actually held the ball, but it was also a measure of how good the visitors were in the early stages and Cas did well to weather the storm. Shenton added: “Credit to Hull, they were exceptional against us early on. “We weren’t massively poor in the first 10 minutes. “Our tryline was terrible but we gave a couple of cheap penalties and before we knew it we were 12-0 down. “Marc Sneyd just punishes you with his kicking game and goal-kicking and that scoreline soon gets out of hand.